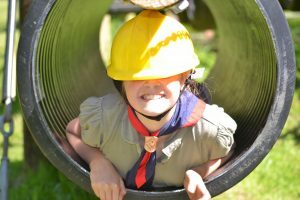 During their time in the Pack, Cub Scouts will get a chance to try lots of different activities like swimming, music, exploring, computing and collecting. There are a range of badges available which Cub Scouts can wear on their uniforms to show everyone how well they’re doing. Cub Scouts also get to go on trips and days out, to places like the zoo, theme parks or a farm. Sometimes they will be able to go camping with the rest of the Pack and take part in all kinds of outdoor activities. A Pack of Cub Scouts is organised into Sixes, with each Six named after a colour, and a Sixer and a Seconder in charge.